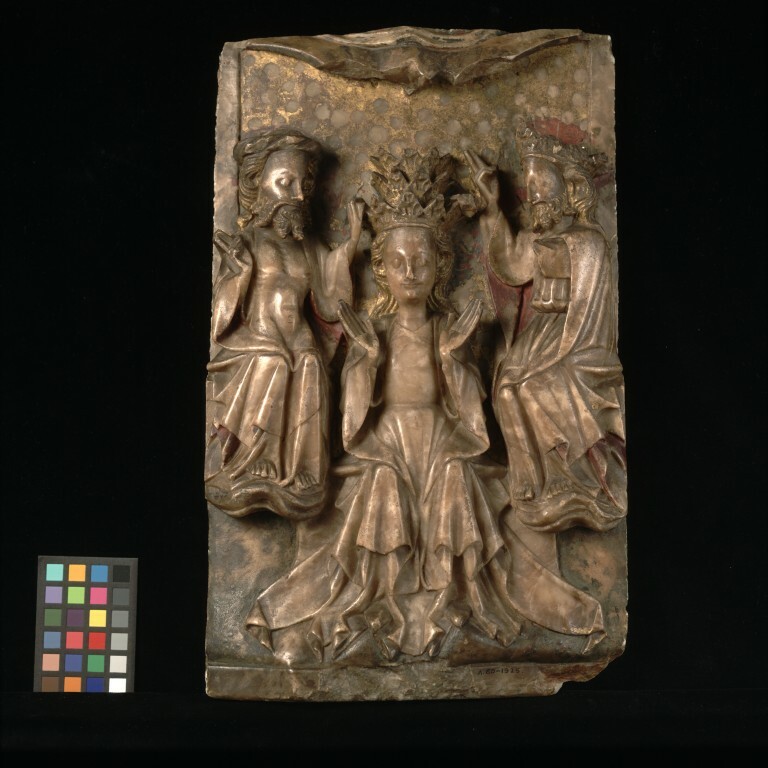 This panel in alabaster, probably made in the 15th century England, represents the Coronation of the Virgin. The upper part of the panel has plain borders on each side. There is a border in three planes at the bottom of the panel. The Virgin, wearing a gown and a cloak over her shoulders which falls into intricately carved folds, is enthroned in the centre of the panel. She wears a large triple crown and her hands are raised apart in an attitude of prayer. Above her to the left enthroned on an undulating ledge, indicating heaven, is God the Son, bearded and wearing the torse and a cloak draped over his knees, leaving the upper part of his body bare. He turns towards the Virgin and touches her crown with his left hand; his right hand is raised in blessing. God the Father, crowned and bearded and wearing a girded gown and a cloak, is seated in a similar position on the right of the panel, his right hand raised in blessing. Both are shown with bare feet; the Virgin wears shoes. At the top of the panel, the Holy Spirit is represented by a large Dove which is attached to a cloud-like shape made up of two wavy lines, doubtless representing heaven. The head and wings of the Dove have been badly damaged. The bottom of the panel is badly chipped. Gilding remains on hair, beards and crowns. There is also gilding on the upper background of the panel with the remains of gesso knobs. There are traces of red on the folds of the cloaks of God the Father and God the Son. There are also traces of darkened green paint at the bottom of the panel. The back of the panel bears four lead-plugged holes with the remains of latten wires. The bottom has been cut away. On the back of the panel. In the possession of Mr Murray Marks. Possibly from the Cernuschi Sale. Acquired by Sir Wilmot Herringham and given by him in 1925. York Festival Exhibition. English Medieval Alabaster Carvings (exhibition catalogue). York, 1954, no. 57.